The Coast guard issued a high-surf advisory Thursday and warned surfers and swimmers to be on the lookout for dangerous sneaker waves. 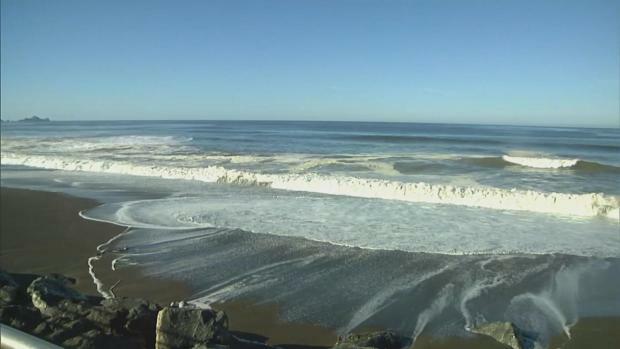 Even the regulars at Pacifica State Beach said it was tough to catch a clean wave Thursday afternoon. "The waves are a little big for this beach," said Francis St. Amant. Ann Hicks and her two kids enjoyed the massive swells from a safe distance. "They’re only a sneaker if you’re not watching," she said with a snicker. "I think it’s pretty strong for the kids to play." A couple of miles north along the cliffs in Pacifica, Michele Coxon is among those who welcome the winter waves to her backyard. She says a lot of people have moved away because they can’t sleep. "This is paradise day, absolutely," she said. Huge boulders nearby act as a buffer between the ocean and Coxon's living room. But just up the street, her neighbors don’t have the same protection. One of the cliffs has been crumbling into the ocean since early 2015. "Pretty soon, we’ll have beachfront property, and they’ll charge us for that," business owner Simone Dimapasoc said. The coastal hazard was issued on Thursday at 6 a.m. and extends through Friday at 5 a.m. It covers the coastline from Point Reyes National Seashore to Big Sur.